and reprint requests to: Dr Alastair J Baker, Department of Child Health, King’s College Hospital, Denmark Hill, London SE5 9RS. Hepatitis GB virus-C (HGBV-C)/hepatitis G virus (HGV) infection was investigated in 106 children with liver disease (54 boys and 52 girls, mean age 7.3 years); 12 with chronic hepatitis C virus infection, 29 with positive hepatitis B surface antigen, nine with idiopathic fulminant hepatic failure, seven with graft dysfunction after liver transplantation associated with autoimmune features, 20 with cryptogenic liver disease, and 29 with autoimmune liver disease. HGV RNA detected by reverse transcription polymerase chain reaction was found to be positive in 4/106 patients (3.8%). Risk factors were identified in three patients, including blood transfusion and/or medical treatment in Eastern Europe. The prevalence was higher than that of blood donors but lower than that of 2 adult patients with liver disease. HGV is not associated with any specific disease group and does not seem to be a major aetiological agent of liver disease in childhood in the UK. After the identification of hepatitis C virus (HCV) as a major cause of post-transfusion non-A, non-B hepatitis,1 there remained a small number of cases in which no agent could be found. Recently, two new viruses were identified; hepatitis G virus (HGV) and hepatitis GB virus-C (HGBV-C).2 3 HGV and HGBV-C have 95% sequence homology and are probably independent isolates of the same virus.4 HGV infection has been reported in 0.9–1.7% of blood donors2 5 and in up to 60% (more than 5% in the majority of reports) of adult patients with liver disease or with risk factors for parenteral infection.2 5-13 Although there are several reports of HGV infection in adult patients, very little is known about HGV infection in children.14 15 In this retrospective study, we have assessed the prevalence of HGV infection in children with liver disease and the clinical features and risk factors of those found to have HGV infection. One hundred and six patients with liver disease receiving treatment at the Paediatric Liver Service at King’s College Hospital were enrolled in the study (54 boys, 52 girls, age range 1 month–20 years, mean 7.3 years). Twelve had chronic HCV infection and were positive for HCV antibody (UBI HCV enzyme immunoassay; United Biomedical, New York) and HCV RNA (Amplicor assay; Roche Diagnostics, Hoffmann-LaRoche, Basel, Switzerland). Twenty nine were positive for hepatitis B surface antigen (HBsAg, enzyme immunoassay kit; Abbott Laboratories, Chicago, USA). Twenty two of 27 with chronic infection were also hepatitis B e antigen positive (HBeAg, enzyme immunoassay kit; Abbott Laboratories, Chicago, USA). Two had fulminant hepatic failure and were both HBsAg positive and anti-HBe positive. Nine children had cryptogenic fulminant hepatic failure with severe coagulopathy despite parenteral vitamin K, viral, toxic, metabolic, and autoimmune hepatitis having been excluded by appropriate investigations. Seven children who had received a liver transplant for various conditions (extrahepatic biliary atresia in four, fulminant hepatic failure in one, Alagille’s syndrome in one, and α1-antitrypsin deficiency in one) were studied at the time of graft dysfunction accompanied by autoimmune features as reported elsewhere.16 Twenty patients had cryptogenic chronic liver disease as defined by biochemical evidence of chronic hepatitis for more than six months and exclusion of known causes of liver diseases by appropriate investigations. Histology showed chronic hepatitis in all cases; nine had evidence of periportal hepatitis. Eight had mild biliary features but cholangiography was normal. Three had severe portoportal or portocentral bridging fibrosis compatible with a previous severe hepatitis. Eighteen had established fibrosis or cirrhosis. Twenty nine children had autoimmune liver disease, 21 being positive for anti-liver-kidney microsomal antibody (LKM), seven for antismooth muscle antibody/antinuclear antibody (ANA), and one for LKM and ANA. In this group, three LKM positive children had presented with fulminant hepatic failure. Serum samples from these patients were obtained retrospectively from the serum bank in our department. The serum samples tested had been obtained on admission in 14 children with fulminant hepatic failure, during episodes of graft dysfunction in seven children after transplant, and during follow up in the remaining 85. Further samples were analysed from those patients found to be positive for HGV RNA. Sera had been kept at 4°C for a brief period pending separation, stored at −70°C and were thawed only before the present analysis. Ethical committee consent was obtained. HGV RNA was detected by the reverse transcription polymerase chain reaction (RT-PCR) method. RNA was extracted from 100 μl of serum using RNA zol (Biogenesis), and converted to complementary DNA (cDNA) using random primers. The cDNA was amplified by the PCR with primers 5′-CGGCCAAAAGGTGGTGGATG-3′ and 5′-CGACGAGCCTGACGTCGGG-3′, which were deduced from the nucleotide sequence of the 5′ non-coding region. A digoxigenin labelled deoxynucleoside triphosphates mixture was used for labelling of the PCR products (Boehringer Mannheim, Germany). PCR was carried out for 45 cycles consisting of denaturation for 15 seconds at 94°C, annealing for 30 seconds at 55°C, and extension for 30 seconds at 72°C (Perkin Elmer Thermal Cycler PE 9600). The PCR products were detected by enzyme linked immunosorbent assay (ELISA, Boehringer Mannheim, Germany) using a biotinated probe 5′-GGTAGCCACTATAGGTGGG-3′. To avoid cross contamination, PCR was performed under the stringent conditions recommended by Kwok and Higuchi,17 with one positive control and two negative controls for every PCR round. The result was considered to be positive when the optical density was more than three times that of negative serum. HGV RNA was detected in four out of the 106 children (3.8%) (table 1). One had cryptogenic fulminant hepatic failure, one chronic hepatitis B infection, one post-transplant graft dysfunction with autoimmune features, and one cryptogenic chronic liver disease. In the transplant case, HGV RNA was detected in serum during the period of graft dysfunction and in samples obtained before transplantation and immediately after transplantation. In case 4 with cryptogenic liver disease, positive results were obtained at 19 months of age, but no further samples were obtained. A British boy with a negative perinatal, postnatal, and family history developed Coombs positive haemolytic anaemia at the age of 4 months. On bone marrow examination, a diagnosis of haemolytic anaemia probably secondary to a viral infection was made. He was successfully treated with prednisolone and required two blood transfusions. At 7 months of age, he developed fulminant liver failure and was transferred to our unit. Viral, toxic, metabolic, autoimmune, and infiltrative causes of fulminant hepatic failure were excluded. He received full intensive care but his condition gradually deteriorated and he died on the fourth day after admission. Postmortem liver histology showed massive hepatic necrosis and a moderately heavy, predominantly monocytic inflammatory cell infiltrate in the portal areas, suggesting a possible viral aetiology but no giant cells. HGV RNA was detected in serum taken on admission and three days after admission. A Romanian girl was adopted by British parents at the age of 12 months. Her perinatal and postnatal health and family history are unknown. On arrival in the UK, a course of hepatitis B virus (HBV) vaccination was started because of the presence of another adopted girl in the same family who was HBsAg positive. During the course of vaccination, however, case 2 became HBsAg and HBeAg positive. HBV DNA was 174 pg/ml and aspartate aminotransferase (AST) was 128 IU/l (fig1). A liver biopsy specimen taken at the age of 2 years and 10 months showed chronic persistent hepatitis. She was treated with interferon alfa (3 megaunits/dose, three times a week, for six months). During treatment, she seroconverted to anti-HBeAg, HBV DNA became negative, and the AST level became normal. HGV RNA was detected before interferon was administered. During and after treatment, the PCR for HGV RNA became negative. Her adopted sister was negative for HGV RNA. Case 2: a case of chronic HBV presented at the age of 2 years. HGV RNA was detected before interferon (IFN) treatment, but became negative after the interferon (HbeAb=hepatitis B e antibody). A boy from Bosnia was diagnosed to have chronic liver disease at the age of 9 years complicated two years later by severe gastrointestinal bleeding. He required an unknown number of blood transfusions and underwent splenectomy and a distal splenorenal portosystemic shunt in Bosnia. At the age of 17 years, he was referred to our unit for investigation and treatment of his liver disease. Radiography of his thoracic spine showed a butterfly vertebra and cardiac catheterisation showed mild pulmonary stenosis. Ophthalmological examination showed an Axenfeldt anomaly (embryotoxon) behind both corneas.18 A liver biopsy specimen revealed an established cirrhosis with marked ductopenia, severe cholestasis, and accumulation of copper associated protein. Based on these findings, he was diagnosed as having Alagille’s syndrome with chronic liver failure. He underwent orthotopic liver transplantation at the age of 19 years. There was a mild increase in AST one month after surgery and the AST value fluctuated thereafter. Atypical liver kidney microsomal antibody was positive. IgG was 19.5 g/l (normal = 7–18.6 g/l). A liver biopsy specimen showed perivenular cell necrosis without endothelitis nor bile duct damage, and a moderate portal inflammatory infiltrate consisting of lymphocytes, which was suggestive of an aggressive hepatitis. The AST values, peaking at 591 IU/l gradually improved after prednisolone was increased to 50 mg/day and then tapered to 10 mg/day. HGV RNA was found to be positive seven months before transplantation and three months and seven months after transplantation. A British boy was born four days after term by normal vaginal delivery. There were no postnatal problems and he had no history of blood transfusion nor a significant family history. At 8 months of age, he was found to have an enlarged hard liver 7 cm in the midaxillary line and a spleen palpable 5 cm below the costal margin. Levels of γ-glutamyltransferase, AST, bilirubin, albumin, calcium, phosphate, α1-antitrypsin, and lactate were within the normal range. The early antigen test for cytomegalovirus was positive. Autoantibodies were negative. Metabolic causes of liver disease were excluded. Sweat test was normal. A bone marrow did not show evidence of storage cells. A liver biopsy specimen taken at 14 months of age showed extensive bridging fibrosis with parenchymal micronodule formation, suspicious of cirrhotic transformation and mixed inflammatory cell infiltration. He had not received blood products at any time. HGV RNA was positive at 19 months of age. The mother’s HGV RNA was negative five months after the patient tested positive. The mother had no risk factors for parenteral virus infection. This is the first report of the prevalence of HGV RNA positivity in a large cohort of children with liver disease. Akin to previous reports in adults, we have found that HGV RNA positivity is not associated with any specific liver disease in children.2 12 The prevalence rate (3.8%) found in this study is higher than that reported in blood donors (0.9–1.7%)2 5 and is therefore likely to be higher than in healthy children. It is lower than that of adult patients with liver disease or adults with high risk of parenteral exposure. Positive HGV RNA has been reported in 16.7% of patients with post-transfusion non-A-E hepatitis,2 18.8% of those with chronic HBV infection,2 47% of multiply transfused patients,11 and 24% of intravenous drug abusers.13 The incidence of HGV infection in adults is likely to be higher than in childhood because of the potential for more frequent exposure to parenteral infection. A high rate of HCV and HGV coinfection has been reported in adults suggesting that the routes of infection of HGV may be similar to those of HCV.2 8 9 13 19 20 Risk factors for HGV infection include transfusion of blood products, intravenous drug use, and vertical transmission.2 11 13 21 Among our cases, two had definitely received blood transfusions, one in the UK and one in Bosnia, while one had been cared for in a Romanian orphanage where she may have been exposed to infected blood products or instruments. Although the geographic distribution of HGV is not known, it may be particularly prevalent in Eastern Europe where the rates of HBV and HCV infection are much higher than the UK.22 23 In only one case (case 4), could we not identify any risk factors. This patient was diagnosed as having liver cirrhosis of unknown cause at 8 months of age, and mother-to-infant transmission is possible,21 but maternal HGV RNA was negative. This does not exclude maternal transmission as the mother may have cleared the virus since delivering the child. Alternatively this may be a case of sporadic HGV infection, implying modes of transmission not yet recognised. In case 1, there is no direct proof of a relationship between HGV and fulminant hepatic failure, although HGV RNA was present at the time of liver failure. From our findings, it would appear that HGV is not a major cause of fulminant hepatic failure in children since HGV RNA was found in only one out of 10 patients with cryptogenic and in none of the five with HBV infection or autoimmune hepatitis and fulminant hepatic failure. Case 2 was infected by HGV and HBV. After interferon treatment, HBe antibody appeared, HBV DNA and HGV RNA disappeared, and liver function tests normalised. As reported before, interferon reduces HGV blood levels,9 25 but it is not clear whether HGV is in any way related to liver dysfunction. In case 3, HGV RNA was detected before and after liver transplantation. Graft dysfunction due to reinfection with HBV and HCV after transplant is well recognised.26 27 It would not be surprising if HGV infection also persists after transplantation. Although it may be argued that HGV might be the cause of graft dysfunction in patient 3, he is the only HGV positive patient among seven children with graft dysfunction and autoimmune features in our series.16 It is likely, as previously suggested, that HGV viraemia occurs after liver transplantation and persists in immunosuppressed patients,15 but it probably does not contribute to dysfunction in the graft.19 20 28 Our findings, although not from a large enough group to be entirely conclusive, are in favour of HGV being an innocent bystander in chronic liver disease in childhood, but its role in idiopathic neonatal hepatitis, aplastic anaemia,29 or hepatocellular carcinoma may warrant further examination. It has been suggested that autoimmune liver disease is triggered by a viral infection. The observation of LKM1 positivity in adult patients with chronic HCV infection has led to speculation on the possible role of HCV in the aetiology of type 2 autoimmune hepatitis.30This was further strengthened by the description of common amino acid motifs between HCV and CYP2D6 the target of LKM1.30 HCV, however, does not seem to play a part in autoimmune hepatitis in childhood.31 From our results, it would appear that HGV infection is not associated with autoimmune hepatitis in childhood either. The presence of HGV in serum is not associated with any particular chronic liver disease nor with acute liver failure in the UK. To date no disease has been shown to be caused by HGV. We do not recommend HGV PCR as a clinical test in the evaluation of children with acute or chronic liver disease. Patients found to be HGV positive when tested for research purposes should be followed up with annual clinical reviews and HGV RNA PCR assay to establish the prognosis of the infection. Furthermore, as no proof has been provided so far that HGV causes any liver disease we suggest that the term hepatitis virus G (HGV) is prejudicial and the term ‘GBV-C’ with the letters GB having no significance beyond the historical description of the discovery of the virus is preferable. In due course a phytogenetically derived name will no doubt be ascribed. (1989) An assay for circulating antibodies to a major etiologic virus of human non-A, non-B hepatitis. Science 244:362–364. (1996) Molecular cloning and disease association of hepatitis G virus: a transfusion-transmissible agent. Science 271:505–508. (1996) Infection with hepatitis GB virus C in patients on maintenance hemodialysis. N Engl J Med 334:1485–1490. (1996) GBV-C virus and fulminant hepatic failure. Lancet 347:1552. (1996) Histopathological impact of hepatitis GB virus C (GBV-C) infection on C virus chronic hepatitis. Hepatology 24:227A. (1996) Effect of hepatitis G virus co-infection on patients with chronic hepatitis C. Hepatology 24:226A. (1995) Detection of the GBV-C hepatitis virus genome in serum from patients with fulminant hepatitis of unknown aetiology. Lancet 346:1131–1132. (1996) Hepatitis G virus in long-term survivors of haematological malignancy. Lancet 347:1632–1633. (1996) Hepatitis G infection in drug abusers with chronic hepatitis C. N Engl J Med 334:195–196. (1996) Detection of GBV-C RNA in serum and liver of children with chronic hepatitis B and C. Hepatology 24:228A. 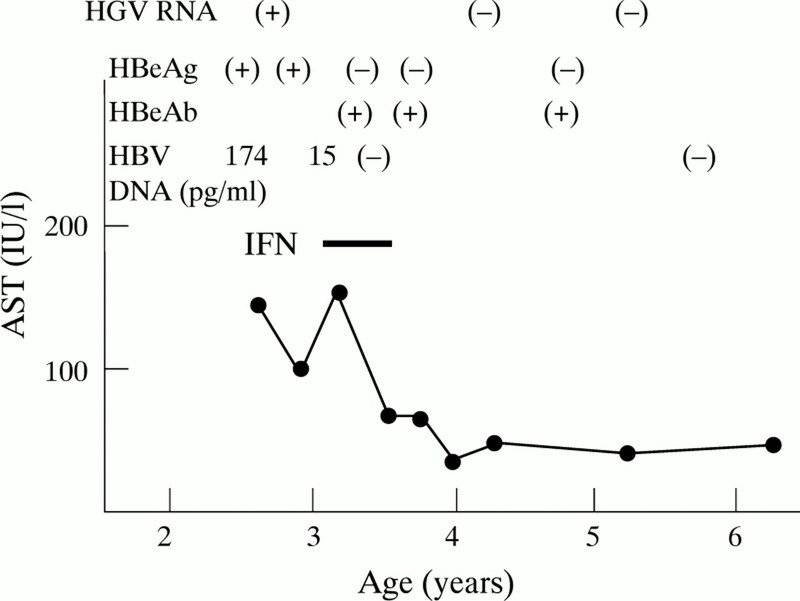 (1996) Hepatitis G virus in immunosuppressed paediatric allograft recipients. Lancet 348:751. (1996) Graft dysfunction associated with autoimmunity in paediatric liver transplantation. Hepatology 24:235A. (1989) Avoiding false positives with PCR. Nature 339:237–238. (1997) Ocular ultrasound in Alagille syndrome: a new sign. Ophthalmology 104:79–85. (1996) The impact of hepatitis GBV-C/HGV agent in patients transplanted for HCV-cirrhosis. Hepatology 24:419A. (1996) GB virus C infection in patients with chronic hepatitis B and C before and after liver transplantation. Transplantation 27:711–714. (1995) Hepatitis B prevention in Europe: a preliminary economic evaluation. Vaccine 13 (suppl) S54–S57. (1995) Epidemiology of hepatitis C in the West. Semin Liver Dis 15:5–13. (1996) Natural history of hepatitis G virus in chimpanzees. Hepatology 24:413A. (1996) Hepatitis GB virus C. N Engl J Med 335:1393. (1994) ‘EUROHEP’ consensus report on the management of liver transplantation for hepatitis B virus infection. J Hepatol 21:1140–1143. (1996) Long-term outcome of hepatitis C infection after liver transplantation. N Engl J Med 334:815–820. (1996) Hepatitis G virus and post-transplantation hepatitis. N Engl J Med 335:1394–1395. (1996) Hepatitis G-associated aplastic anaemia. Lancet 348:472. (1994) Progress in pediatric autoimmune hepatitis. Semin Liver Dis 14:282–288. (1997) The prevalence of antibodies to hepatitis C and Herpes simplex virus type 1 is not increased in children with liver kidney microsomal type 1 autoimmune hepatitis. J Pediatr Gastroenterol Nutr 23:534–537.